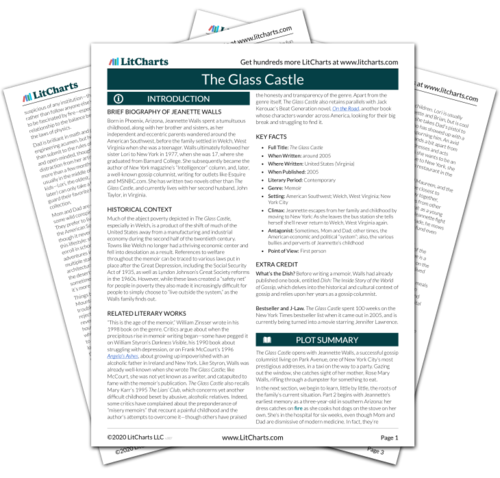 Instant downloads of all 942 LitChart PDFs (including The Glass Castle). 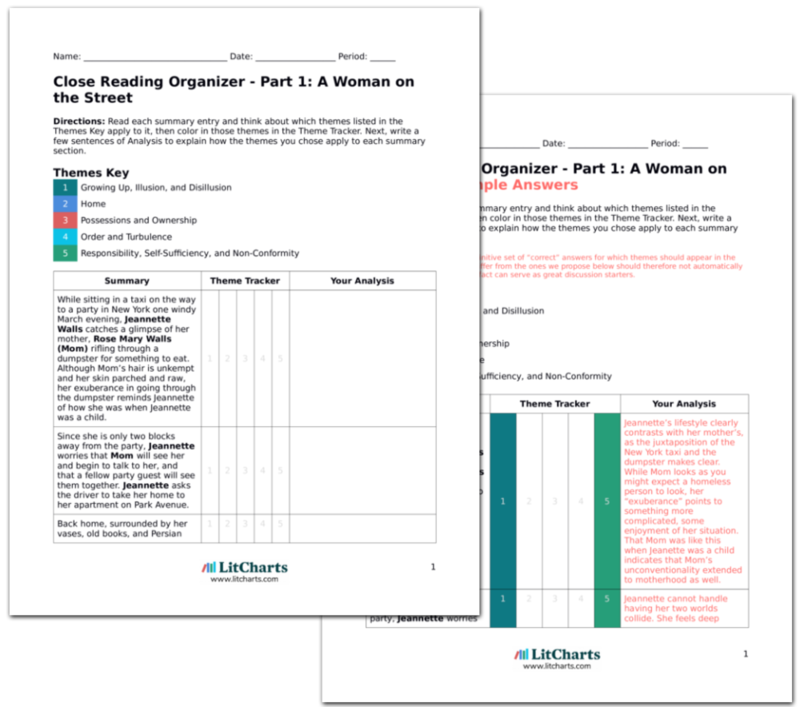 Welcome to the LitCharts study guide on Jeanette Walls's The Glass Castle. Created by the original team behind SparkNotes, LitCharts are the world's best literature guides. A concise biography of Jeanette Walls plus historical and literary context for The Glass Castle. A quick-reference summary: The Glass Castle on a single page. In-depth summary and analysis of every part of The Glass Castle. Visual theme-tracking, too. Explanations, analysis, and visualizations of The Glass Castle's themes. The Glass Castle's important quotes, sortable by theme, character, or part. Description, analysis, and timelines for The Glass Castle's characters. Explanations of The Glass Castle's symbols, and tracking of where they appear. An interactive data visualization of The Glass Castle's plot and themes. Born in Phoenix, Arizona, Jeannette Walls spent a tumultuous childhood, along with her brother and sisters, as her independent and eccentric parents wandered around the American Southwest, before the family settled in Welch, West Virginia when she was a teenager. Walls ultimately followed her sister Lori to New York in 1977, when she was 17, where she graduated from Barnard College. She subsequently became the author of New York magazine’s “Intelligencer” column, and, later, a well-known gossip columnist, writing for outlets like Esquire and MSNBC.com. She has written two novels other than The Glass Castle, and currently lives with her second husband, John Taylor, in Virginia. 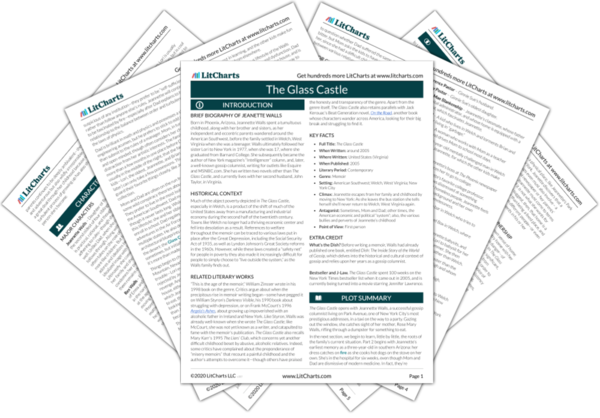 Get the entire The Glass Castle LitChart as a printable PDF. Much of the abject poverty depicted in The Glass Castle, especially in Welch, is a product of the shift of much of the United States away from a manufacturing and industrial economy during the second half of the twentieth century. Towns like Welch no longer had a thriving economic center and fell into desolation as a result. References to welfare throughout the memoir can be traced to various laws put in place after the Great Depression, including the Social Security Act of 1935, as well as Lyndon Johnson’s Great Society reforms in the 1960s. However, while these laws created a “safety net” for people in poverty they also made it increasingly difficult for people to simply choose to “live outside the system,” as the Walls family finds out. “This is the age of the memoir,” William Zinsser wrote in his 1998 book on the genre. Critics argue about when the precipitous rise in memoir writing began—some have pegged it on William Styron’s Darkness Visible, his 1990 book about struggling with depression, or on Frank McCourt’s 1996 Angela’s Ashes, about growing up impoverished with an alcoholic father in Ireland and New York. Like Styron, Walls was already well-known when she wrote The Glass Castle; like McCourt, she was not yet known as a writer, and catapulted to fame with the memoir’s publication. The Glass Castle also recalls Mary Karr’s 1995 The Liars’ Club, which concerns yet another difficult childhood beset by abusive, alcoholic relatives. Indeed, some critics have complained about the preponderance of “misery memoirs” that recount a painful childhood and the author’s attempts to overcome it—though others have praised the honesty and transparency of the genre. Apart from the genre itself, The Glass Castle also retains parallels with Jack Kerouac’s Beat Generation novel, On the Road, another book whose characters wander across America, looking for their big break and struggling to find it. Climax: Jeannette escapes from her family and childhood by moving to New York: As she leaves the bus station she tells herself she’ll never return to Welch, West Virginia again. What’s the Dish? Before writing a memoir, Walls had already published one book, entitled Dish: The Inside Story of the World of Gossip, which delves into the historical and cultural context of gossip and relies upon her years as a gossip columnist. Bestseller and J-Law. The Glass Castle spent 100 weeks on the New York Times bestseller list when it came out in 2005, and is currently being turned into a movie starring Jennifer Lawrence. Baena, Victoria. "The Glass Castle." LitCharts. LitCharts LLC, 17 Jun 2015. Web. 18 Apr 2019. Baena, Victoria. "The Glass Castle." LitCharts LLC, June 17, 2015. Retrieved April 18, 2019. https://www.litcharts.com/lit/the-glass-castle.